Please follow this link for the 1.0 manual. Please follow this link for the 2.0 manual. The 4-Play and Gamer-Pro use HID (Human Interface Device). No drivers are needed or recommended. For firmware updates and tools see the Download Section. The 4-Play and Gamer-Pro do not natively support Xinput. It can do so, however, with the use of 3rd party software (ie. x360ce ). Although a power supply can be used on the 4-Play, it is not required. A 12v power supply is completely optional and simply allows the HUB to be self-powered and supplies additional power for a stronger Playstation Force Feedabck effect. It is important to note that Force Feedback will still work correctly without it. The Game-Pro supports Force Feedback on all capable controller expect the PlayStation. An additional in-line adapter will be needed to rumble the Playstation controller. This adapter is available to purchase. Full Emulation: A wide variety of controllers are fully supported right out of the box. This includes even complex features like the Sony Playstation 2’s pressure sensitive buttons or the Sega Dreamcast’s VMU. The Compatibility List shows everything currently supported. This list is periodically updated and amended as we expand the Bliss-Box’ s capabilities. Multi-platform: Use your 4-Play/Gamer-Pro on almost any modern operating system. 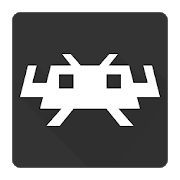 The 4-Play and Gamer-Pro works on Windows, OSX, Linux, Raspberry Pi, most all Android device. Plug & Play: The 4-Play and Gamer-Pro do not need software or drivers to be installed by the user. 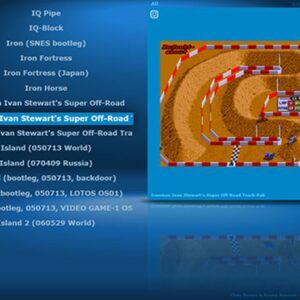 Simply plug the 4-Play in and select your emulator, game, and controller. Hot Swap This feature makes it easy to switch between controllers in mid-game. If Auto Pause is enabled (default setup) The 4-Play/Gamer-Pro will pause your game while you switch, and you can continue playing when you’re ready. The new controller is detected automatically. Easy-Upgradable Firmware: The 4-Play/Gamer-Pro can be quickly updated via USB with a firmware file downloaded from our website. This allows new features and controllers to be added painlessly. Each 4-Play controller port has its own firmware chip so multiple firmware versions can be used if desired. Global Button Mapping: The 4-Play/Gamer-Pro’s internal button mapping is set up so that buttons on different controllers match each other’s layouts as closely as possible. This makes Hot Swapping more intuitive. For additional details, see the layouts at the end of this doc. Force Feedback and rumble: Controller rumble works on a wide variety of controllers. The currently supported rumble controllers are the Nintendo 64, Nintendo GameCube, Sony Playstation , Sony Playstation 2, and the Sega Dreamcast. The Gamecube racing wheel supports force feedback steering. Auto Pause: When the adapter senses the controller has become unplugged, it presses the pause button. 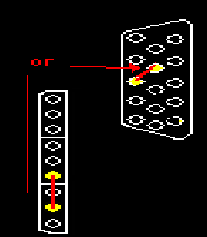 Retro Arch Hotkey: Pressing Start+Select or Shoulder Left + Shoulder Right will fire an additional button. You may configure this button for a hot key in front-ends like Retro Arch it also servers as the ‘home’ button where applicable. 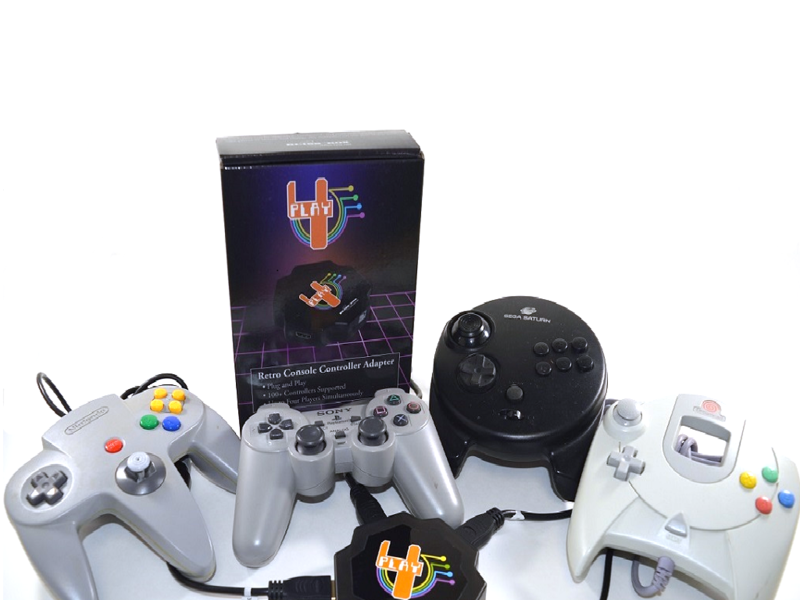 Native support: The 4-Play and Gamer-Pro have the ability to allow communication from the emulated game directly to the controller and back with any of the supported controllers (N64, Gamecube, Playstation, partial Dreamcast). Developer API: The Both the 4-Play and the Gamer-Pro have an API with which emulator developers can communicate directly with and transfer data. This allows native support for advanced features. For example, developers can use the API to see exactly which controllers are currently connected to the 4-Play or Gamer-Pro for displaying on the screen or automatic custom remapping. Also native support for saving to the controller’s attached memory card or even write images to the Dreamcast controller’s LCD screen. Support for the GameCube’s Gameboy Advanced Link can be added, and the emulator can talk directly to the controller bypassing dirrectx. The possibilities are endless. An API tool is also available on the download page. With this tool you may turn on and off the configurable features listed below. LLAPI (Low Level API). In addition to the developer API , 3.0 now has a wire to wire mode for getting data and controlling the Bliss-Box. This is simply done over the existing USB wires and can be used with other devices. The first device to utilize this is the Bridge. An add-on that allows the Bliss-Box to work on many consoles. This product is still under development. The second device to take advantage of this LLAPI is the ever-growing MiSTer. The MiSTer can use the Bliss-Box in LLAPI mode and directly poll controllers with no USB involved. Configurable Features for the 4-Play and Gamer-Pro where applicable. Auto Pause Disabled: Turns on and off auto pause mode. D-Pad-(UDLR): This allows the player to use the D-Pad to play a games instead of the analog stick. This also allows you to hot swap to non-analog controllers while playing an analog game. Analog to D-pad: This mode was added for retro arch. This mode maps d-pad only controllers to buttons instead of default mapping to analogs. D-pad Only: This is a read only mode and it cannot be set. This mode will turn off when any analog movement is seen. It simply tells you if you are using a controller with no analogs. Button Rotation: This mode rotates the four face buttons CCW. Button Mapping: The API tool allows alternative mappings. There are presets for Sony Playstation 3, Xbox 360, Android, and default. You may also make your own presets. Map Assist Mode: This mode will center all analogs. This is done for those stubborn emulators that don’t know how to ignore some of the analogs. If you are trying to set up your buttons in an emulator and it tells you that you are pressing some button down, use this mode. Hotswap Disabled: Using this feature may have undesirable effects. This will prevent auto searching for controllers (hotswap). To switch to another controller, a reset will be needed. Port Naming: Each port can now be named a player. A special USB ID is saved for each port and named “Bliss-Box 4-Play.x” Where x equals the player you specified. Save to EEPROM: The 4-Play can save all of your features per port. You can see your saved setting by using the API Tool. This also works with the Gamer-Pro. Features you can program without the API tool. Button Rotation Mode: All 4 face button (hold for 3 seconds) (Cannot be turned on in the API Tool). If desired, just use the button mapping. In general, the 4-Play and Gamer-Pro are capable of detecting your controller type within one to three seconds of it being connected to your system via USB or when swapping controllers. With the exceptions listed below, you should not press any buttons during this period or while connecting your controller. Plug in your controller of choice and then plug in the 4-play or Gamer-Pro via usb. Wait for the USB tone without pressing any inputs. If verification is needed, open your control panel in Windows and navigate to the controller section to ensure it is attached and working. If you plug in the adapter to your computer without a controller attached it will go in to Arati mode and remain in this mode until reset is hit or the device is unplugged. Plugging in a controller will have no effect and the adapter will continue to assume it is in Atari mode. This mode is used for Atari and like controllers that really have no electronics in them. Once in Atari mode there is no way to detect a new controller. So, to leave this mode you must press the reset button. When you first plug in the 4-play any ports without a controller plugged in will default to Atari mode. If a port is not detecting a controller, it may be in Atari mode. 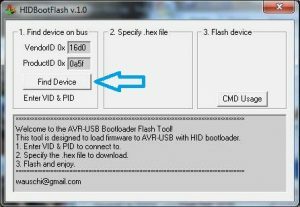 If your port seems unresponsive or does not show up in the USB controller list, a bad flash or HID corruption may have occurred. You can repair the port by entering safe mode and re-flashing. To enter Safe Mode, unplug the 4-Play or Gamer-Pro. Press and hold down the reset button on the port you wish to repair. Plug the 4-Play/Gamer-Pro in without releasing the reset button and proceed in flashing the port. If you are having troubles holding down the button and have a psx or jaguar dongle you man use this trick by shoring the pins with a paper clip (French ‘Trombone’). The white arrow in this image indicates the port that becomes active in Single-Player Mode. The mode is toggled via the DIP switches on the base of the 4-Play unit as follows: Do not read the labels on the DIP’s themselves, follow the sticker. There is a reset/upgrade button beside each port on the 4-Play. During normal use it works as a reset button, forcing the unit to re-detect the connected controller. If you hold it down, however, it tells its 4-Play port to go into upgrade mode. When you release it, it will go back to normal operation. To upgrade firmware, you must first hold down the reset/upgrade button. The first time you do this, your system will indicate, “BLISS-UPDATOR hardware found.” Make sure to let the driver installation finish before letting go of the button. For upgrades, you can use the API tool or the older HIDBootFlash v.1.0, both found in the Download Section. 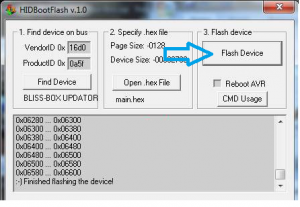 To flash the device with the flash tool follow the steps below. The Gamer-Pro is also equipped with a reset.upgrade button. Step 2: Specify your firmware.hex file. 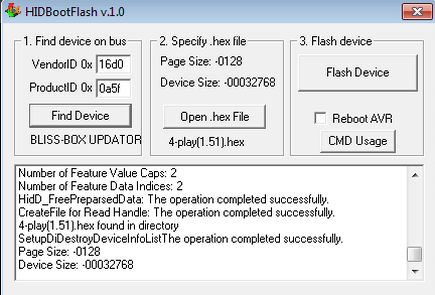 Caution: Do not release the upgrade button during firmware flash as you may cause a bad flash and be forced to re-flash the port. Step 4: Release the reset/upgrade Button to return to normal operation. Low Level API Mode. Please refer to the online documentation to use this feature. The following images are based off the HID windows assignments. Bliss-Box has 24 HID buttons available. Some controller can make use of the alternative mapping (seen in blue). HID is, for the most part, trouble free. Use normal USB troubleshooting techniques to fix any devices that aren’t correctly detected. Unplugging the USB, using another port, or restarting the computer is a good place to start. Third-Party controllers in general you should have no problems, however they are not always designed the same way as the original manufacturer intended. Some might work on the console but with the 4-Play or Gamer-Pro. For example, most Mad Catz Nintendo 64 and Nintendo GameCube controllers work but Mad Catz Sega Dreamcast controllers don’t. See the compatibility list for more info. Please contact Support if a specific emulator is giving you trouble or if you still have issues after reading the FAQs below. The forums are another great place for fast and helpful resource. Will the Gamer-Pro and 4-play work with my emulator? Unless an emulator does not support HID, it will work. Bliss-Box does not have control over what an emulation author does, however. As long as they fully support HID, everything will work. Development teams are quick to resolve issues to ensure full functionality. Some older, DOS based emulators do not work with HID. 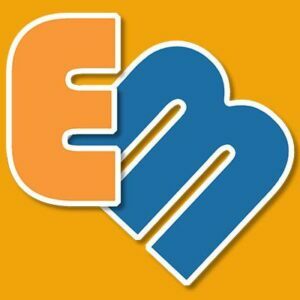 If you have trouble, contact the emulator author and work with them to get it resolved. Why are there only 3 ports? A1. The switches are wrong. Do not read the switch values (on/off). Follow the picture and match it up correctly. A2. You may have a bad flash, try safe mode. A3. Make sure there is not a driver conflict and that the driver finished loading. A4. In many rare cases shipping can cause damage to a port. (contact us). Why aren’t some of my buttons working? A2. Is this an official gamepad? If not support could be added. (contact us). A3. Some connectors may need replacing. If you feel the connector is faulty, it is replaceable (contact us). A5. Does the controller work? Old controllers can be dirty or worn out, test on the console. Why am I getting random nonsense inputs? A1. The firmware will attempt to auto detect, so make sure your controller is plugged in when you connect the USB. Do not press button during detection unless required. A3. Some Sega Dreamcast and Nintendo GameCube controllers might act this way (contact us). Why isn’t my Coleco number pad working? Reset the device, the adapter is in Atari Mode. Make sure to hold down the indicator button as indicated in the Controller Detection section. My SNES or NES makes the X go left when I hit a button, what’s wrong? Reset the device, the adapter is in Atari Mode. Why aren’t my sega X Y Z buttons working? The controller may be in 3-Button Mode. Hold down the Start button and reset. Why do I have more buttons on the HID window than my controller has? This is normal; it’s part of saving space on the microchip. It will not affect game play or setup. Why does my Guitar Hero guitar have the left button (button 13) held down? The port is in normal Sony Playstation mode. Keep the Guitar connected, and hot the reset button. What do I do if my controller works but it isn’t included on the Compatibility List? Great! Use the forums and tell us what it is and the model, so we can add it! If my controller isn’t on the Compatibility List, will it work? It might, give it a try! If it doesn’t, we can probably update our firmware so that it does! Can you make my control work even if it’s listed as not working? contact us! We’re willing to bet we can make it work and add it to our firmware. How can I force Windows to detect my ports in a specific order? Use the API Tool. There is a menu Item for setting the port order. All of my ports are named the same? Use the API Tool to configure the port order. My atari Paddles are jumpy. If your cable does not have a round dot on the tag, consider buying the updated cable. If you do not wish to purchase a new cable use an Extension Cable. 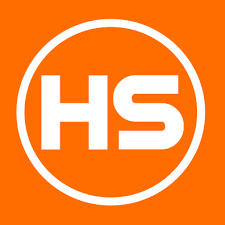 Support is provided for all products via email or on the forums. If the problem is found to be hardware related, contact us within 30 days of the shipment received date to get a replacement. Firmware related issues can be handled on the forums or via email. We want you to be fully satisfied with your purchase. You may receive a full refund for any unsatisfied orders with in 15 days minus the shipping costs. A restocking fee may occur for any non defective refunds past the 15 days of the arrival shipment. You must return it with all original packaging. If you checked out with Paypal please note, PayPal adds a 2.9 percent refunding fee. For defective parts or returns past 15 days and up to one year, contact us for an RMA. 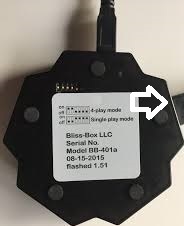 NOTICE: Bliss-Box cannot support or endorse any modified firmware. If you are running a custom or modified firmware it will void your warranty. If an RMA is submitted and an unofficial firmware is loaded onto the device, Bliss-Box reserves the right to apply a fee upon returning the unit to you. The item must be returned in good condition, in the original box, and with all parts and accessories for a full credit. Please send email to: [email protected] with the title “RETURN: [purchase order#]” where purchase order is the purchase number from the store. If the item was purchased via one of our resellers, first contact them. If purchased on our website you can find the purchase order number in your email purchase email. If you have troubles locating the purchase order number please contact us via the same email.